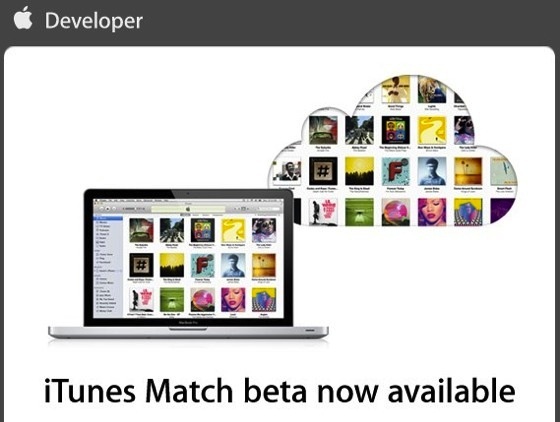 The first beta version of iTunes Match has been released for developers to subscribe to. The service stores an entire music library within iCloud and allows you to stream or download your music from anywhere, including iPhone, iPad, iPod touch, a Mac, or even Windows PC. This is done without uploading files, instead iTunes Match scans your library and matches it within the iCloud service, even providing the music at a higher bit rate in the process. To use iTunes Match beta, developers need the latest version of iOS 5 beta and iTunes 10.5 beta 6.1. Despite being a beta release, iTunes Match service costs $24.99 per year, but dev users will receive an additional 3 months of free service in addition to their 12 month plan. The cloud storage capacity of an iTunes Match library is separate from whats included in the iCloud plans, which makes the price even more competitive. Those who aren’t developers will have to wait for iCloud and iTunes Match to be released alongside iOS 5 this fall. Streaming to an iPhone is only so useful with the restrictive and expensive data plans that plague US consumers. This means the best feature of iTunes Match is that for $25 you can legalize an entire pirated collection and then re-download it at 256KBps, not bad for those who still carry Napster and Limewire music around. Does iCloud preserve any changes that we make to the song info (e.g. changes to Genre)? Or does it keep the info that the iTunes store assigns?